It sounds like the title of a 1970s sci-fi novel, but diatomaceous earth is actually a white powder 30 million years in the making. At first glance, diatomaceous earth (DE) looks like finely milled flour, but under the microscope you can see the fossilized shells of algae called diatoms. These prehistoric plankton remains have numerous uses: from swimming pool filter, to pesticide, to nutritional supplement. DE is a medium often used in water purifiers and pool filters. The intricate shapes of the tiny algae skeletons serve as a microscopic sieve, catching fine particles that would clog a paper filter. A DE filter could effectively clean tap water contaminated with heavy metals and viruses, absorbing up to 80 percent of the viral strains, according to a study published in the Journal of Applied and Environmental Microbiology. Taken internally, DE can help filter people, too. A spoonful of food grade DE is often used as a gentle daily detoxifier. 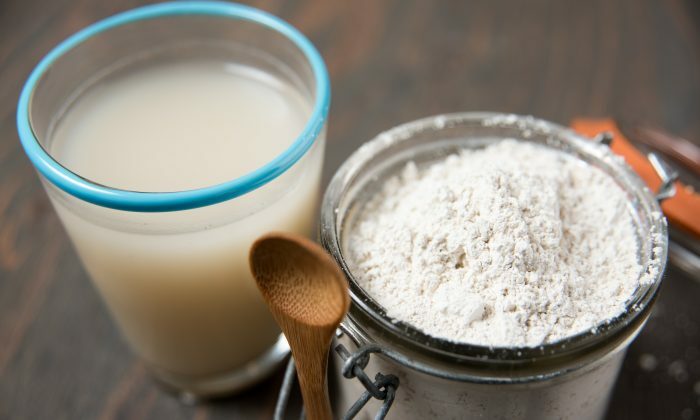 If eating white dirt sounds too weird, consider that anyone who eats grain products already consumes DE, because it is a common additive in commercial flour. It serves as an anti-caking agent, and it kills off insects that wander into the grain bin. DE is also added to toothpaste where it serves as a gentle abrasive. Food grade DE is non-toxic and safe for humans and animals to take internally. However, it is lethal to insects. The difference is a matter of scale. For larger beings, the mild abrasive nature of the microscopic diatoms cleanse the internal body without harming the tissue. For tiny bugs, however, DE means certain death. The larger particles cut into their bodies like shards of glass. Finer particles absorb the waxy fats in the outer layer of insect exoskeletons, and they die of dehydration. Given DE’s ability to kill bugs, it is also believed to kill parasites as well. DE is found in many commercial pesticide products. DE is a trusted remedy for bed bugs in particular, provided you can get them to walk through it. On its own, DE doesn’t attract insects, nor does it give off poisonous fumes. Bugs have to come into contact with DE for it to work. Given DE’s ability to kill bugs, it is also believed to kill parasites as well. However, research examining this idea has had mixed results. A 2011 study from the Oxford Journal of Poultry Science found that hens dusted with DE had fewer mites. However, another study investigating DE as a de-worming agent in cattle showed that it performed no better than the control group. Another reason to take a daily dose of DE is because it is a rich source of a mineral called silica. Silica is the second most abundant mineral in the Earth’s crust (after oxygen), yet its role in human health is often overlooked. Silica deficiency can lead to osteoporosis, brittle nails, thinning hair, bleeding gums, and sagging skin, yet it is still not considered essential to human health. Several foods contain silica, such as oats, nettle leaf, and radishes, but we don’t get nearly as much as our ancestors did. Crops get their silica from the soil, and our soil has been depleted of this mineral due to modern farming methods. Evidence suggests that regular DE consumption may also rid the body of heavy metals. A study published in the American Journal of Clinical Nutrition found that silica can prevent the body from absorbing aluminum. As far as supplements go, DE is dirt cheap. You can get a 10-pound bag of high quality, food grade DE for about $20. The most important factor to consider when consuming DE is to make sure you get the food grade stuff. The DE used in pool filters contains high levels of crystalline silica which is toxic to the body. The silica in food grade DE is primarily amorphous silica which can be safely ingested. It also contains other beneficial minerals, such as calcium, magnesium, and iron. Don’t eat DE dry, always mix it with water. Not only is it a more pleasant experience, but silica combined with water creates orthosilicic acid which our bodies can absorb and use to form and strengthen tissues. Start with one teaspoon of food grade DE in eight ounces of water, and take on an empty stomach. DE can be dehydrating, so be sure to follow with a second glass of water. After a few days on this regimen you’re likely to notice bulkier bowel movements. If you can’t take the mild chalky taste of a plain water drink, mix it in a fruit smoothie. You won’t notice it at all. Another way to use DE is as a exfoliating facial scrub. Mix with water and apply like soap to remove dirt, oil, and dead skin. Make a thicker mixture for a skin detoxifying mask.